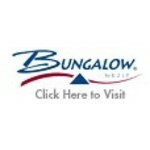 Bungalow® by EZ-UP's Designer Preferred line is the only superior-quality cabana that can be installed in minutes. The distinctive shelters provide years of outdoor living with the patented 'instant' technology, engineered with the highest-quality materials available and combined with award winning designer patterns. EZ-UP's Bungalow Designer Preferred line ensures effortless portability, maximum weather resistance and lasting impressions with family and guests. Bungalow Shelters are designed to be set up and remain set up for continuous enjoyment. The Bungalow Preferred Pavillion shelter comes with your choice or Sidewalls or Insect Screens! Insect Screen Set also includes- Full screen walls, attach to enclose entire pavillion. Center zippered openings allow easy access for you, but keep the bugs to a minimum! Openings at the corners allow the full wall deluxe tie back curtains to go through and wrap around the leg, creating an elegant look with drawn back curtains while allowing you the protection of the screen room.